Moles are often a brownish colour, although some may be darker or skin-coloured. They can be flat or raised, smooth or rough and some have hair growing from them. Moles are usually circular or oval with a smooth edge. You should check your skin regularly for any new moles & any changes to existing moles. A mole can change in weeks or months. 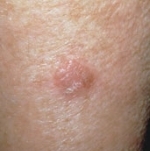 Seborrhoeic keratoses look like raised warts. They can be skin-coloured, black, dirty-yellowish or a grey-brown colour. They most often develop on the chest and tummy and are common in older people. Freckles are small, flat brown marks that often appear on the face or areas exposed to the sun. They are caused by an increased amount of melanin, the pigment that gives your skin colour. Sun spots (solar lentigines) are brown marks on the skin, especially the face and arms, which can develop on people who spend a considerable amount of time in the sun. These tend to appear later in life. While most moles are benign (non-cancerous), in rare cases they can develop into melanoma. Melanoma is a serious and aggressive form of skin cancer. Melanomas usually appear as a dark, fast-growing spot where there wasn't one before, or a pre-existing mole that changes size, shape or colour and bleeds, itches or reddens. The main treatment for melanoma is surgery, although your treatment will depend on your circumstances. BCC is a cancer of the basal cells at the bottom of the epidermis. It's also known as a rodent ulcer. It’s very common and accounts for more than 75% of all skin cancers in the UK. Most BCCs are very slow-growing and almost never spread to other parts of the body. It may start as a small lump that gets bigger. The edges usually have a shiny or pearly look. The middle is usually depressed (sunken). BCCs do not usually hurt unless knocked. But they can be itchy and may bleed if scratched. SCC is a cancer of the cells (called keratinocytes) found in the outermost layer of the skin (the epidermis). It’s the second most common type of skin cancer in the UK. 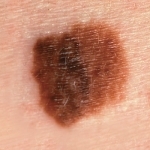 One in five skin cancers (20%) are this type. Usually squamous cell carcinomas are slow-growing and only spread to other parts of the body if they are left untreated for a long time. Squamous cell cancer most often develops in areas that have been exposed to the sun. These areas include parts of the head, neck, and on the back of your hands and forearms. Squamous cell skin cancer can look like a crusty, scaly ulcer. Or it may be bumpy and hard and develop into an ulcer. Malignant melanoma is a dark, irregularly shaped growth with uneven reddish-brown, brown, or black colouring. This is a less common type of skin cancer than the two other types mentioned above. About 11,000 people in the UK are diagnosed with malignant melanoma each year. Melanoma behaves differently to basal cell and squamous cell cancers. It can grow quickly and needs to be treated early. Although it’s not always possible to prevent melanoma, avoiding overexposure to UV light can reduce your chances of developing it. So apply your sunscreen and cover up! View more pictures of abnormal moles.